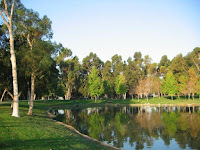 This morning about 8 am, while my husband and daughter slept in, I slipped off to the local park a few blocks from our home for a sunshine-filled walk....something I rarely do. A 30-something couple, her with a walker, he walking alongside, gently helping her. They laughed together, sat on a bench for a while, then slowly walked a bit farther. And walkers of all ages, sizes, and ethnicities, with and without dogs...mothers and daughters, women friends, couples, singles. Everyone savoring the moment and enjoying the morning. The pastoral park scene reminded me of the beauty of life.